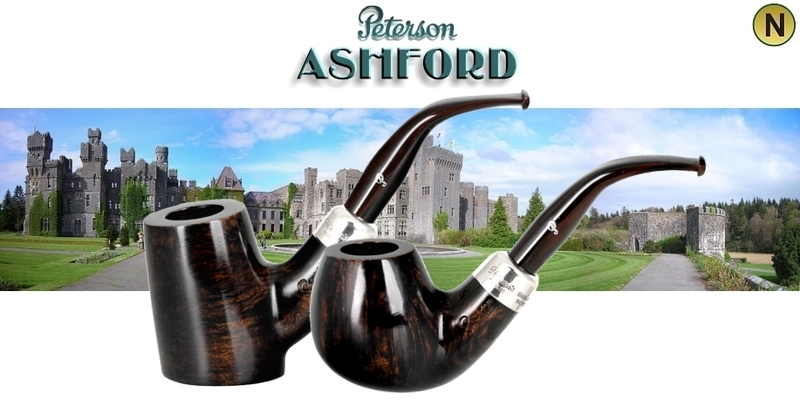 Following up on the recent blog on Mario Lubinski’s Italian-market Peterson lines for 2013, here’s what was added to the 2013 lineup in the 2014 catalog. 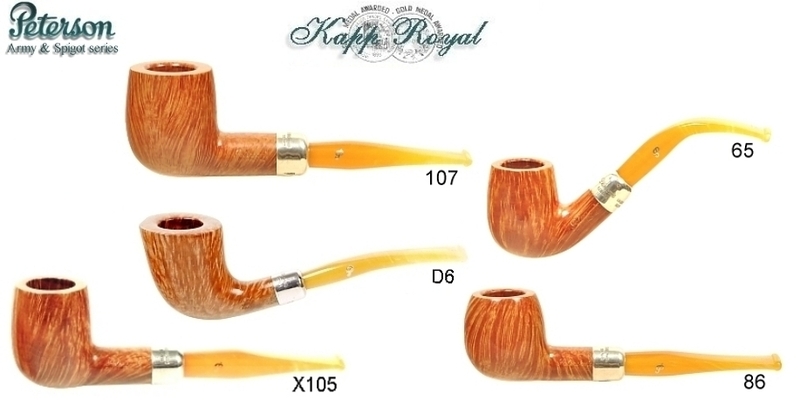 The Kapp Royal line was actually introduced by Lubinski around 2004, and remains the pinnacle of what I know about his co-creations with Peterson. I wanted to be sure to include it here because his 2014 on-line catalog had so many wonderful illustrations of what the line looks like. It’s got the embedded aluminum P, of course (indicative of Peterson’s highest lines). And it’s also got Lubinski’s favorite stem—the marmalade acrylic, reminiscent of the old amber. I’ve noticed 2015 and 2016’s acrylic marmalade stem stock has been improved over earlier years—you can expect more interesting striation patterns than the ones you see in these illustrations. 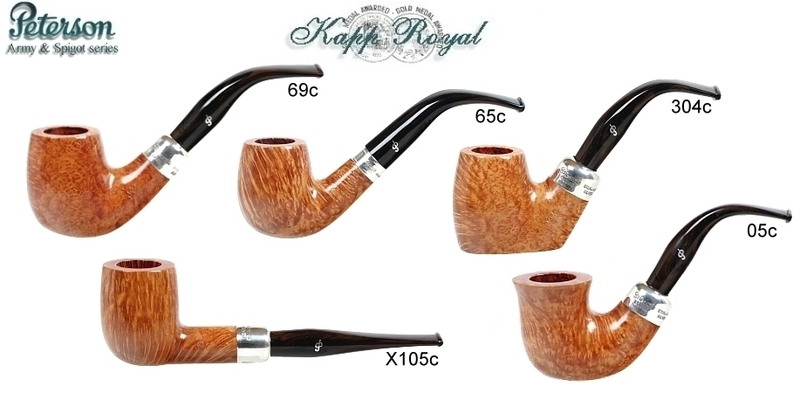 In 2014, Lubinski introduced the Kapp Royal Cumberlands—changing out the marmalade for a dark brown with reddish swirl “cumberland” acrylic stem. Don’t confuse this with the old -style vulcanite cumberland of red and brown striations, or you’ll be disappointed (or maybe you won’t). I’ve got a spigot-version of this stem on an XL339, and while it’s beautiful under bright light, in some lighting conditions it just looks shiny-black. I would love to see Peterson do something in a standard line with traditional “brindle” or cumberland stem rod stock. I know these have a bit of a matt finish and will never really take a high shine, but they’re fascinating to look at, and like black vulcanite are so much more comfortable between the teeth than acrylic. In my experience, they don’t seem to oxidize like black vulcanite, either. Of course, while we’re at it, a green and black or green and white cumberland stem would be even more in keeping with Peterson, wouldn’t it? 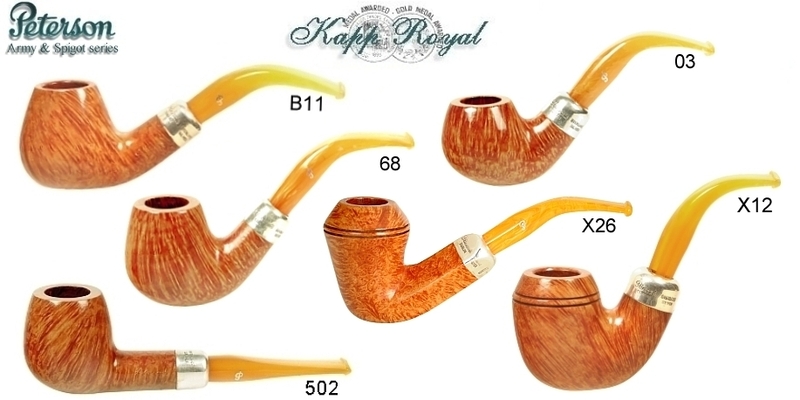 Kapp Royals seem to be the result of high-end bowl surplus or selection, or maybe Lubinski just asks for a certain number of these in any shape. I say that because the shapes themselves appear to be totally random—they could be from the Classic Lines catalog or culled from the POY or special collection B shapes. They’ve become so popular that beginning a few years ago some U.S. e-tailers began offering them, at least in their marmalade-mouthpiece configurations. 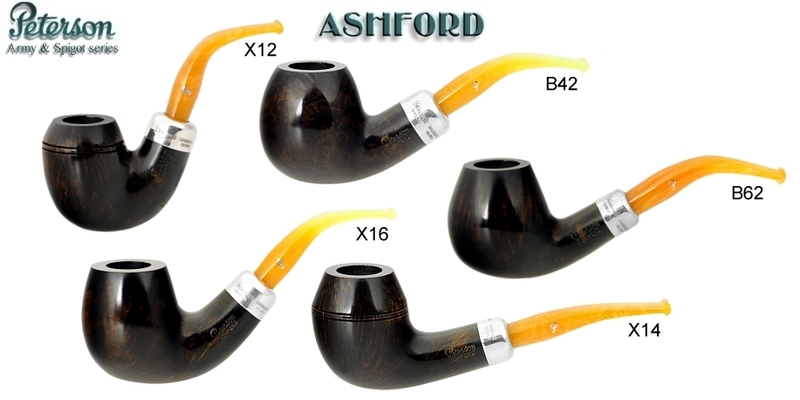 If you’re looking for the cumberland mouthpieces, shop at the Italian vendors. 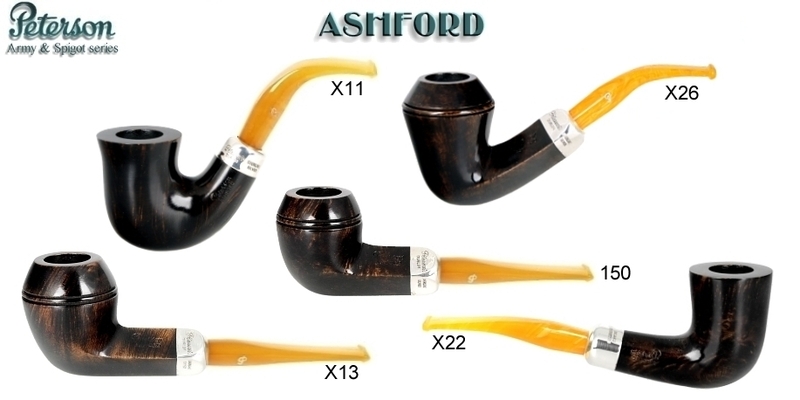 The Ashford was actually introduced in 2013, but it didn’t appear in the Lubinski catalog until 2014. 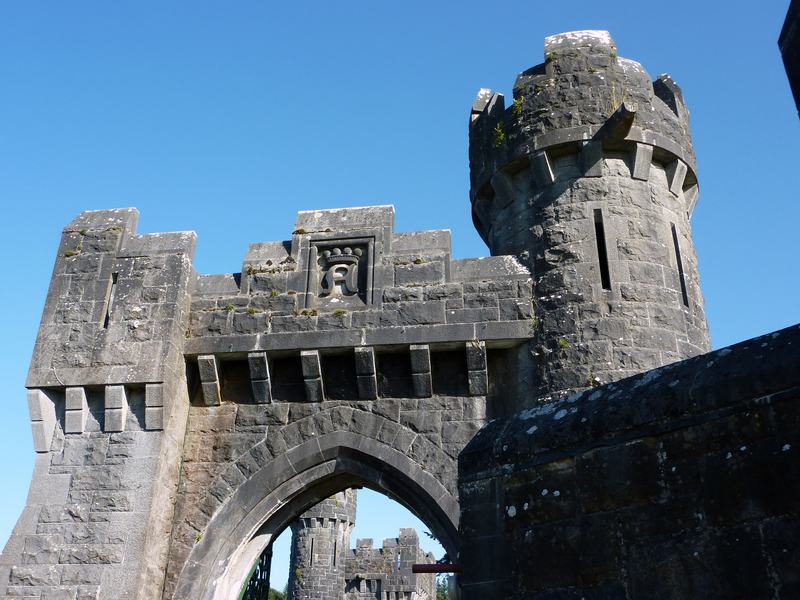 It’s named after Ashford Castle, near Cong, Ireland, where John Ford and his crew stayed while filming The Quiet Man in 1952. It’s a pricey venue, and quite beautiful. Anyway, the Ashford line took off like a rocket, according to Tony Whelan, Jr., and like the nickel-band Aran (also originally a Lubinski co-creation), went to world-wide distribution very quickly. I think the reason for its huge success is that it says “Peterson” in such an inviting way. As an army-mount pipe, it updates and rings changes on Peterson’s long-standing Irish Army and System aesthetic. 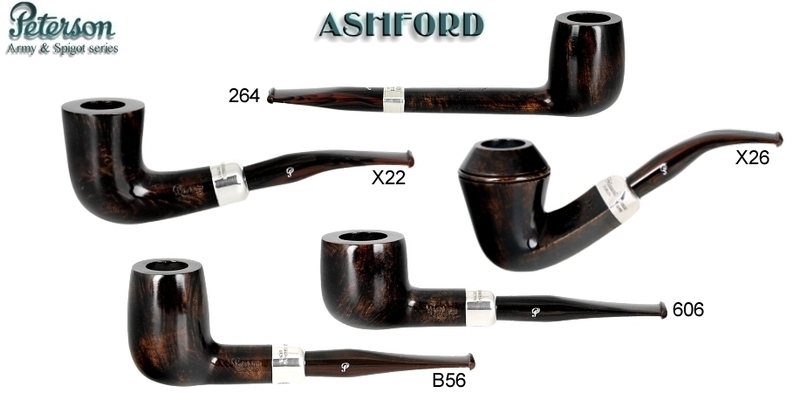 It features a sterling ferrule and glossy black over walnut high-contrast stain. The bowls used are high-quality, but lack sufficient grain for a lighter stain. 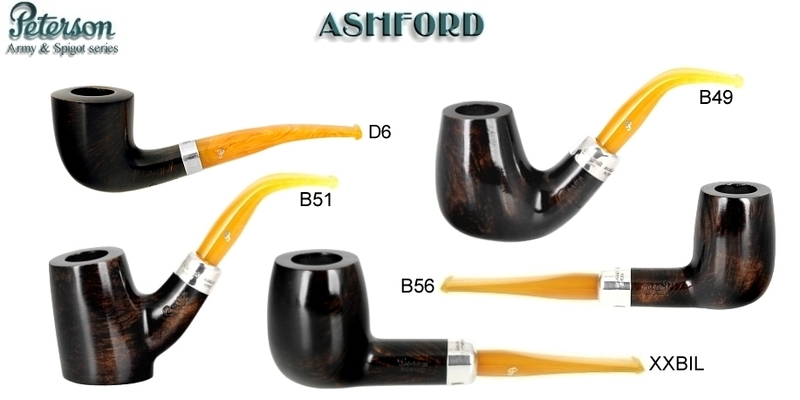 The mouthpieces are acrylic fishtail, of course, being an Italian release, and are stamped with a silver hot foil P.
Here in the U.S. expect to see the acrylic cumberland stem, although I find Lubinksi’s marmalade mouthpiece offerings visually more enticing. You can expect to see both Classic Lines and B shapes, although most of the B shapes will be coming through Lubinski. 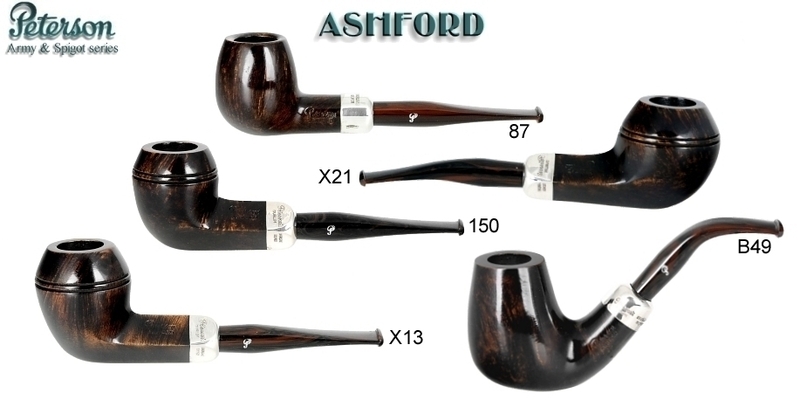 The System is one of my favorite Peterson subjects, and watching it change in stain and finish over the decades, subtract then add new shapes, gave me a great deal to talk about in The Peterson Pipe’s System chapter. 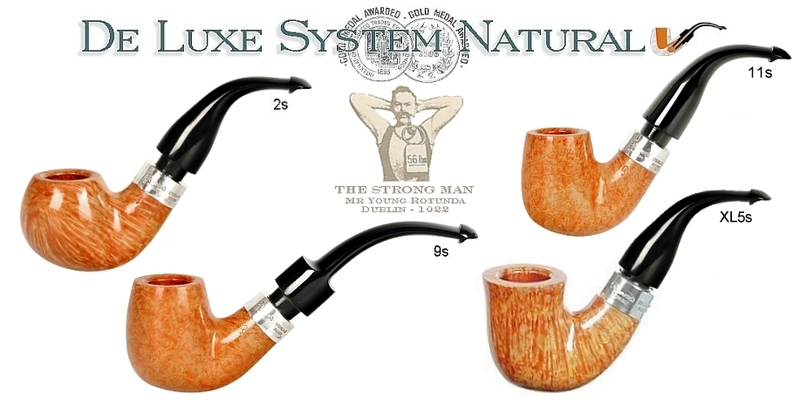 The De Luxe, thankfully, has not degraded in its mouthpieces like the Standard and Premier of recent years. In fact, Peterson seems to be at pains to make sure the De Luxe remains one of its finest lines, although they’re getting fairly difficult to source and amount to only a very small part their total production. 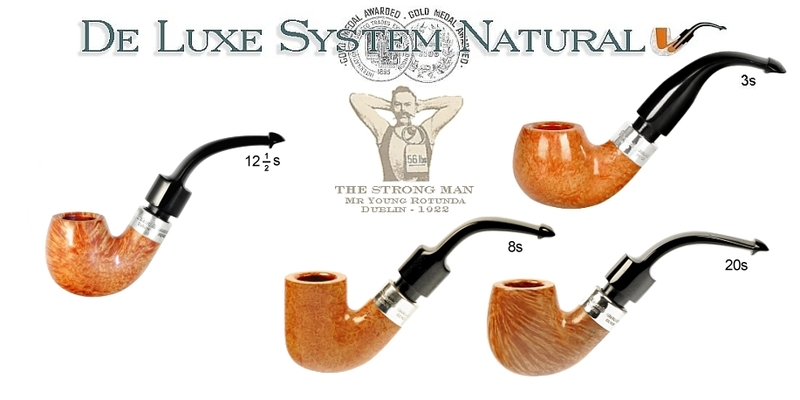 I don’t know whether the De Luxe System Natural actually made its first appearance in 2014, but I like the Lubinski catalog illustrations because he requested that some of them be made up in the old B or tapered stems as well as the standard-issue S or saddle. 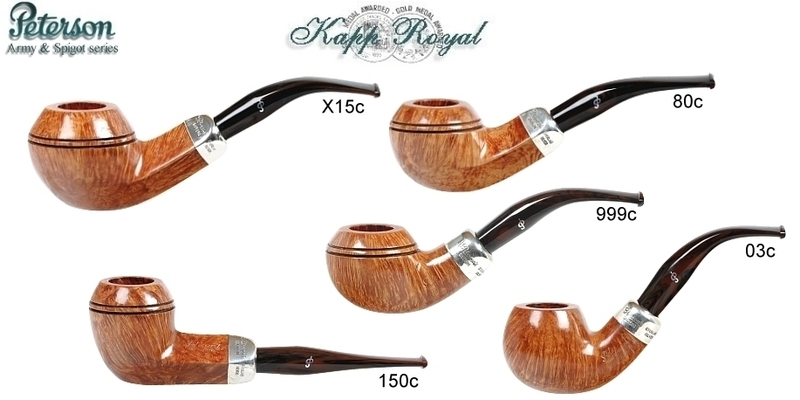 If you’ve never owned a Peterson in the natural finish, I recommend the experience, which can be had in several of their lines, including the Royal Irish, the Kapp Royal and the Supreme. 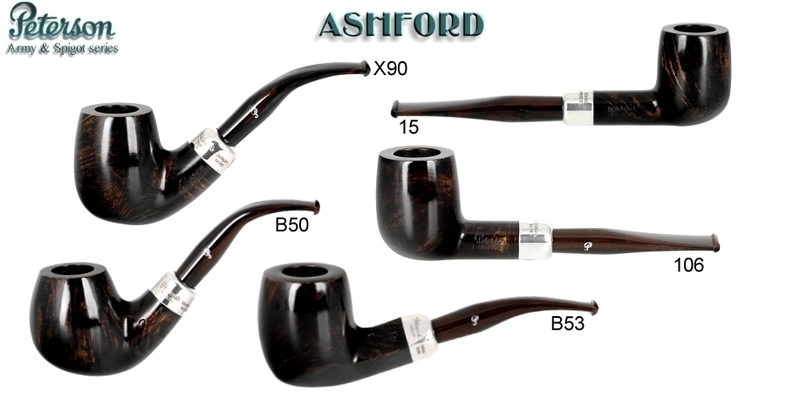 The grain actually seems to be become more pronounced the more you smoke the pipe. The bowl also becomes just a little darker with each smoke. It’s a fascinating process to watch. They definitely chose some beautiful examples to use for the catalog pages.